Sol Bamba (right) in action against Leeds United for Leicester City. Leeds United head coach Neil Redfearn is delighted to have strengthened his defence with the club’s first capture of the January transfer window, but now faces a fight to hold onto a centre-back already at the club. 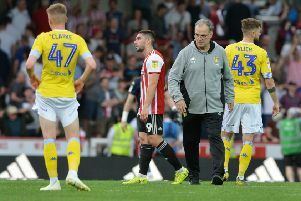 Redfearn has described loan signing Sol Bamba as a “good addition to the squad”, but does not want his arrival to signal the exit of another defender, Jason Pearce, although Wigan are believed to want to former Leeds skipper. On Ivory Coast international Bamba, who has arrived from Serie A side Palermo, the United head coach said: “Sol trained with us for the first time on Friday morning and from what I have seen he looks like he will be a really good addition to the squad. “We know about Sol and what he can bring to the side. He knows the Championship and British football from his time at Leicester City and also from playing up in Scotland. The arrival of Bamba brings added competition to the Leeds defence, which Redfearn believes is vital. He said: “Sol being with us brings competition for the two centre-back places. “He now joins Liam Cooper, Jason Pearce, Giuseppe Bellusci and Dario Del Fabro in competing for those two spots. “Competition keeps players on their toes, both in training and on a matchday. They know if they play well they will keep the shirt. Former Leicester City defender Bamba, 30, became United’s first signing of the January transfer window at the end of last week. He has 44 caps with the Ivory Coast and played in all three of their World Cup group games last summer. He began at Paris Saint-Germain before going on to spend five years in Scotland with Dunfermline Athletic and then Hibernian. January 2011 saw him move to English football as he joined Leicester City, for who he made 55 appearances before joining Turkish side Trabzonspor for £750,000 in 2012. Bamba moved to Palermo last summer, penning a three-year deal, but has been restricted to just one appearance in Serie A so far this season.